One of the greatest intellectuals of India, Acharya Dharmananda Damodar Kosambi (9th October 1876 – 24th June 1947) was a Buddhist, Pali and Sanskrit scholar. The youngest of seven children, Dharmananda Damodar Kosambi was born in Sankhval (or Sancoale) village in the Indian city of Goa in 1876 to Damodar and Anandibai. He was not able to eat food on his own till the age of eight or nine, and was considered the least intellectually-capable of all the boys in the village. However, his parents were hopeful as an astrologer had predicted that he would become intelligent later in life. Kosambi studied in Madgaon before enrolling in a school run by Bhik Bhatji at Chikli. He then attended Raghoba Gopal Prabhu’s school in Aroba for around three months. It was here that he developed a liking for mathematics. However, ill health forced him to return home to Sankhval. After about a year of recuperation, Kosambi was admitted to Standard Two at a Marathi-medium school in the Belgaum district. He was promoted to Standard Five after the annual examination when he came first in his class and scored distinctions in every subject. Unfortunately, Kosambi’s ill health returned, and again he was forced to return to Goa. Kosambi’s father had leased a coconut farm near his house in Goa and Kosambi was given the responsibility of taking care of the coconuts there. In 1891, Kosambi was married. He started to read books of various genres written by great thinkers. Among them were Vishnushastri Chiplunkar, a great writer who had a strong influence on modern Marathi prose; Gopal Ganesh Agarkar, a Brahmin social reformer and thinker from Maharashtra; and Tukaram, a 17th century poet-saint of the Bhakti movement in Maharashtra who was famous for his devotional poetry. Inspired by these towering figures, Kosambi spent a lot of time in solitude and practised deep contemplation, which miraculously cured his chronic heart problem. Kosambi also started to read works of great Marathi poets, and memorised around 30 shilokas (verses) of Bhandarkar’s Sanskrit works. He developed an intense desire to learn Sanskrit, and he left home for the Mahalaxmi temple at Kolhapur without informing anyone. However, life was much more difficult than he had anticipated – he had to beg for alms to survive and missed his father dearly. Eventually, Kosambi returned home. A biography of Lord Buddha had appeared in an 1897 issue of Balbodhmagazine. Kosambi read it several times and began to meditate by focusing on an image of the Buddha in his mind’s eye. When his father passed away in 1898, Kosambi lost interest in household life and his life became a mirror of the life of the Buddha. Kosambi journeyed to Pune with the intention of learning Sanskrit from the Shastris (Sanskrit teachers) while working to support himself. A meeting with Dr Bhandarkar, a Sanskrit scholar and internationally renowned Indologist, changed the course of Kosambi’s life. Impressed by his well-written letter of introduction, Dr Bhandarkar decided to sponsor Kosambi’s education and even gave him a monthly allowance. He began to study at the Sanskrit school of Nagarkar Wada under the tutelage of Mahadev Shastri Joshi, and was given a copy of Govind Narayan Kane’s Jagatguru Gautam Buddhache Charitra (The Biography of Gautama Buddha). It was a translation of a poetic work that was not considered very authentic, but the devotion of the writer left a deep impression on Kosambi’s psyche. Convinced that the Buddha’s thoughts and his religion would immensely benefit mankind, he wanted to journey to either Ceylon or Nepal to study Buddhism. Kosambi first travelled to and studied briefly in Ujjain, Indore, Gwalior, Prayag and Kashi (Varanasi). At Kashi, he met with a young Nepali named Durganath, who helped him to secure a pass to Nepal through family connections. Kosambi then went on a tour of Kathmandu, visiting highly venerated Hindu temples such as Guhyeshwari and Pashupati. Wishing to keep his Buddhist aspirations from Durganath, he went quietly to visit the famous Buddha stupa. However, he was disappointed as there was only a butcher and a few people playing dice at the site, with no scholar or saint nearby. Kosambi then recalled from his reading of the Kashi Yatra that a Buddhist temple embroiled in litigation was located 15 miles to the south of Gaya. He considered spending the rest of his life there as he had become disillusioned with the dismal state of Buddhism in Nepal. However, when he arrived in Bodhgaya, Kosambi heard about a bhikshu named Dharmapal and decided to visit him instead. Another bhikshu at Dharmapal’s house told Kosambi that Dharmapal had gone to Ceylon. Kosambi asked the bhikshu about the Pali language, and the bhikshu showed him several Pali books in the Sinhalese script, and recited some passages from them. Hearing the Pali language being recited was exciting for Kosambi – he realised he would be able to learn it fairly easily because of his background in Sanskrit, from which Pali was derived. The bhikshu then advised Kosambi that the best place to study Pali formally would be with the pandits in Ceylon. When Kosambi revealed his lack of funds and of financial support, the bhikshutold him that the Mahabodhi Sadha in Calcutta might be able to sponsor him. He also told Kosambi that a visiting Sinhalese bhikshu would be departing for Ceylon from Calcutta, and that Kosambi’s journey to that country would be made considerably easier if he accompanied the Sinhalese bhikshu. After a rather prolonged and tedious process of asking for help and sponsorship from various parties, Kosambi finally managed to scrape together the train fare to Calcutta. At the Mahabodhi Sabha in Calcutta, Aghoribabu helped Kosambi find the money he needed to travel to Ceylon. Kosambi enrolled at the Vidyoday Vidyalaya and started studying the Sinhalese script. He spent three years studying under Shri Symanalacharya and took ordination as a Buddhist monk in 1902. He then went to Burma to study Buddhism. In October 1904, Kosambi finally visited his wife and family in Sankhval. He had not seen them for seven years. 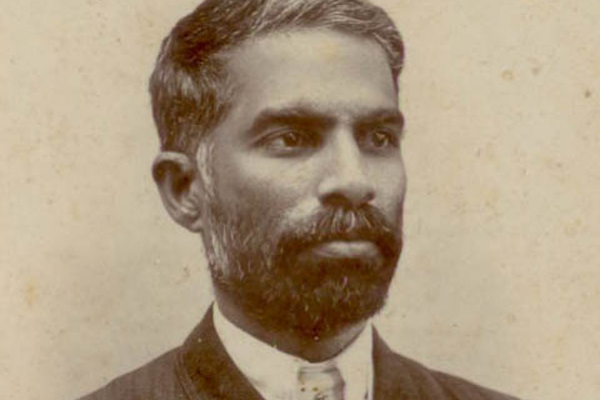 He later returned to India and returned his monk vows through a formal ceremony and became a Professor of Pali in August 1906 at the newly established National College in Calcutta. He was then appointed a Pali lecturer at the University of Calcutta. Although the financial remuneration was good, he was not satisfied internally – the students did not share his enthusiasm for the subject. Furthermore, Kosambi had a deep desire to promote Pali literature throughout the country. Kosambi sought out the Maharaja of Baroda, Shrimant Sayajirao Gaikwad. They were introduced by Shri Satyendranath Tagore ICS, whom Kosambi knew since the founding of the National College. The Maharaja of Baroda agreed to sponsor Kosambi with a stipend for three years. In return, Kosambi was required to write at least one book every year for the state of Baroda. While in Pune, Kosambi completed some parts of the Vishuddhimarga in the Devanagari script, an abridged translation of the Bodhicharyavatara in Marathi, and a Sanskrit primer on Pali grammar. He also gave lectures on the Buddha, the Dharma and the Sangha at various locations in Baroda. Three of these were published in book form. In 1901, Kosambi was contacted by Dr James Wood of Harvard University, whom he had met in Mumbai two years earlier. Dr Wood invited Kosambi to assist Mr Warren, a former Harvard professor with his research on the Vishuddhimarga. As a renowned scholar of languages, Kosambi also studied Russian and travelled in 1929 to the USSR to teach Pali at Leningrad University. He then returned to India at a time when the Indian independence movement was in full swing, and taught at the Gujarat Vidyapith without pay. Because he recruited volunteers for, and participated in the famous Salt Satyagraha led by Mahatma Gandhi, Kosambi was sent to prison for six years. Kosambi played a significant role in Dr B.R. Ambedkar’s conversion to Buddhism. He was also credited with the building of a shelter house for Buddhist monks in Mumbai, the Bahujanavihara. Following the philosophy of Jainism, Kosambi committed to fasting unto death through sallekhana or voluntary fasting. After 30 days of fasting, he passed away on 24th June 1947. Kosambi is remembered for writing Bhagwan Buddha, the biography of Lord Buddha, in Marathi, which was later translated into English and many other Indian languages by the Central Sahitya Academy, New Delhi. He also wrote a Marathi play called Bodhisattva which tells the story of Buddha’s life. Another important work was his autobiography, Nivedan, which was also published originally in Marathi. • Kosambi, M. (2010). Nivedan: The Autobiography Of Dharmanand Kosambi. New Delhi: Orient Blackswan Pvt.